Hank Yeatman has been fishing for striped bass on the Outer Banks of North Carolina for two decades, and he knows the risks of running the shoals at Oregon Inlet. “Oregon Inlet is famous year-round for being treacherous,” says Yeatman, a retired teacher who owns a 26-foot Glacier Bay power cat. In late fall, sport anglers are attracted to the striped bass, also known as rockfish, migrating south and feeding on smaller fish that gather in the shoals, he says. Small boats try to run in, drop their bait — typically eels — then power out before the next wave strikes, Yeatman says. Sometimes the timing isn’t right. In one of the capsizings, Yeatman says he was fishing in the area in late November when a 23-foot boat was struck on the beam by a wave. The next wave flipped the boat, tossing the two fishermen into the surf. They weren’t wearing life jackets, according to Yeatman, who was about 50 yards away. 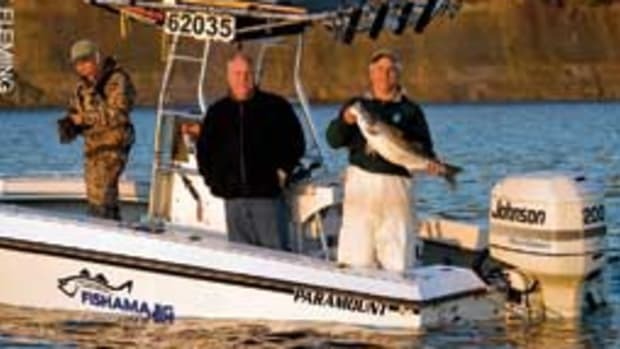 Though he was prepared to help, the charter boat Fishing Fool rescued the men. In a Nov. 20 incident, three fishermen were rescued after their 18-foot boat capsized. The men were picked up by fellow fishermen, who transferred them to a Coast Guard 21-foot rescue boat from Station Oregon Inlet. On Nov. 19 two Pennsylvania men were plucked from the breaking surf by a Coast Guard 41-foot Motor Lifeboat. The men, who were wearing life jackets, told authorities their 17-footer was pulled between the beach and the sandbar on the south side of the inlet, then capsized in the breaking surf. The Coast Guard received a distress call from a good Samaritan, who stood by until the Coast Guard arrived. “Boaters should be reminded, fishing in rough-water situations with breaking seas puts their lives and the lives of their passengers at risk. Rockfish are not worth your life,” says Master Chief Petty Officer Steven Bielman, the officer in charge of Station Oregon Inlet. The Coast Guard also warns that the water temperature in the area in November is 50 to 60 degrees, and hypothermia can set in shortly after immersion. Life jackets and other protective gear can help a person stay warm until rescue. The Coast Guard also urges boaters to pay attention to the weather. Fronts moving through the area can bring drastic changes in wind direction and speed. Seas can rise several feet in a short period of time. “A simple fishing trip that starts in calm water has the potential to quickly turn into a fight for survival,” says the Coast Guard in a statement.